This is the second post of a series dedicated to the basics of Kanban. This article is for the smallest part of the Kanban system – the Kanban card. Kanban (かんばん(看板) from Japanese literally means a signal card or signboard. In the first and original version of Kanban, implemented by Toyota in the 60s the cards are used by the floor workers to signal that a given part has been depleted. This way the workers who are in charge for the in-plant logistics can react immediately and feed the constructors with the parts they need. Sounds simple, and intuitive and the truth is that it really is. This is one of the reasons why “Toyota’s way” has been implemented over the years by many automakers and other types of businesses. Later in 2004 David Anderson, the person who is recognized as one of the pioneers of applying Kanban in the software development, implemented his version of the method with his team in Microsoft. He used the cards as a representation of a work item or a to-do. The first cards were simple post-it notes posted on a whiteboard. This is a practice that is still used by some organizations but the flexibility of the cloud and the extra security makes the electronic version way more popular. The Kanban card could have many attributes. Here we are going to outline the most common ones and as well some additional that Kanbanize software provides. Name/Title: The most logical thing a card could have is a title. The title is as Merriam-Webster states “a word or phrase that constitutes the distinctive designation of a person or thing” in our case the object of this item. ID: The ID is the “serial number” of a card. In Kanbanize every card has its unique ID which cannot be duplicated. It is incremental and this is the easiest way to refer to a card. Assignee: The assignee is the person responsible for this particular card. It could be also someone who is executing the task or just a person that coordinates the activities. Priority: This attribute is really useful to help you prioritize the order in which your cards could be moved, changed, assigned or accordingly processed. In Kanbanize the priority can have three states: Low, Average and High. Color: The color helps you categorize your tasks. 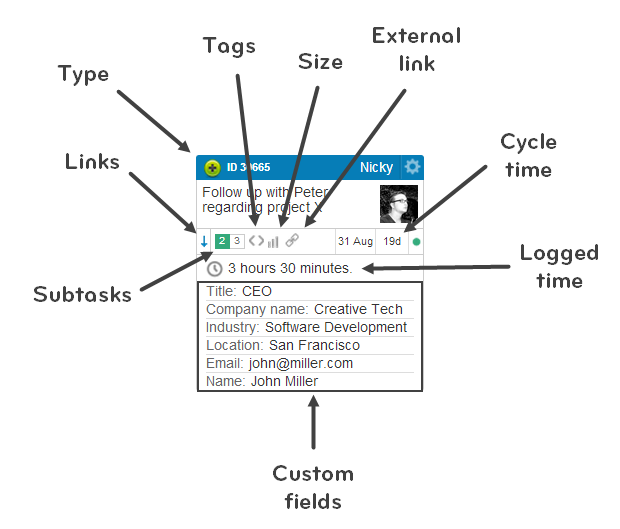 The visual representation of your workflow is of high importance for your efficiency. The color of the tasks is the first thing that captures your attention. That is why the color codes bring simplicity and allow you to fast recognize where to focus without losing extra orientation time. A good example of the possible uses it to set a different color for every given type of tasks e.g. business, personal, research and so on. In Kanbanize there are 6 main colors but when the “arrow” button is clicked a bigger palette appears packed with 90 additional colors. Size: You can indicate how “big” a given task is by adding size to it. This attribute could take values like the planned time a given task takes until, monetary value, weight and others values that will most well fit your use-case scenario. Note, that in Kanban you should try to avoid working with deadlines, rather than process the tasks in the fast possible way and measure the cycle times. Cycle time: Cycle time indicates the time a given card has spent on the Kanban board. In Kanbanize you can also define the columns in which the cycle time is accumulated. For example “Done” could be excluded, so the time that is added to the cards is only from the “Requested” and “In Progress” area. Logged time: Logged time helps you track how much “pure” time you have spent on a given card. The time is logged manually and this could be done through the context menu or “inside” the card. Task type: Task types help you categorize your card by a predefined category. The types are absolutely customizable and are added to every project. Tags: Tags are also a really easy and intuitive way to organize your cards and search them later by given criteria. You could also show your cards as a distribution chart based on the different tags. The ease of use is what makes this attribute so popular. External links: This is an easy way to add a link that points toward external to Kanbanize source. Custom fields: Kanbanize offers many attributes but sometimes there is still a need for additional one. Custom fields are a flexible way to meet your needs by adding your own attributes. Every field could take text, number, date, link value. It also could be a drop-down menu or contributor (team member). Attachments: Of course every card offers the ability to attach files to it, because there is still need to showcase this Excel file and that PowerPoint presentation. 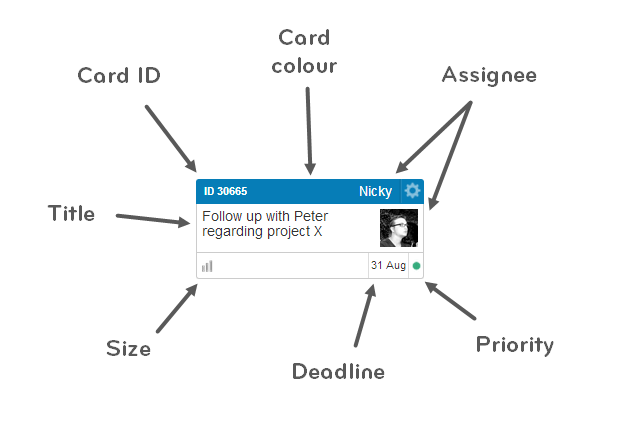 Subtasks: Subtasks are small action items which are part of the bigger one, that is your card. You can look at them as the checklist you need to pass in order to move the card. Links: Links represent connections between tasks. Each card could be connected to other ones in three different hierarchical relations – parent, child, and relative. All of these attributes except for the ID, assignee and the title could be switched on and off, so the card’s look better suits the user’s needs. When you click on the card’s ID or just double-click on it, you will enter the “inside” look of the card. Here is where you can define all of the attributes we talked about earlier and also configure some additional ones. The Kanban card in Kanbanize has six different tabs: Details (the tab which opens automatically), Subtasks, Comments, History, Metrics, and Links. Details: In this tab, you can define all of the attributes which were mentioned earlier plus card’s description and card’s template. This tab also provides navigational drop-down and the ability of “watching”* cards. Subtasks: As was mentioned earlier subtasks are little action items which are part of the card. Subtasks tabs is where you can outline and assign these tasks. This way although a given card can have only one master assignee, it could also have different assignees for the different subtasks. Comments: This is the place where you can add comments to a given card. In case you have the premium version of Kanbanize you can also send comments via email to the interested parties which allow you to lead your whole correspondence through a Kanban card. History: In the History tab, you can view every activity or change that has been applied to a particular card. Every activity or change has a type, event, author, details, and date. Metrics: This tab records the elapsed time and the logged time of your card. You can also view these two types of records by column leaving you with comprehensive information about the card’s transition over time. Links: In the previous section we gave a quick overview of what this functionality does and the different types of “links” you can apply to a card. This tab is the place where you define these relations. You can also view a tree graph of the card’s relations with other ones. *watching cards – watching cards is a functionality which allows you to receive notifications for a given card even if it is part of a board which you are not assigned to. For example, you are part of the financial department but also have a direct interest in a task which is in the marketing’s department board. In order to receive only notifications for this particular card and not for all of the marketers’ activity, you can simply start watching it. Stay tuned for more Kanban 101 posts and… happy kanbanizing! This entry was posted in Kanban, Kanban Resources, Resources on July 25, 2014 by Bisser Ivanov.